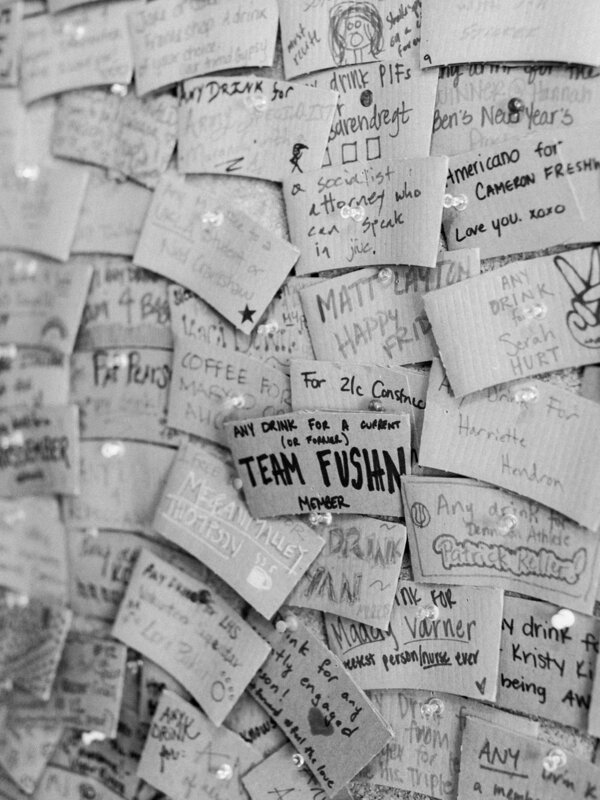 To help celebrate and embody our commitment to community, we offer a “Pay It Forward Board” where a future drink can be bought for anyone for them to redeem at any time. When purchasing a "Pay It Forward" drink, you can make it for anyone, for a certain person, or put "stipulations" on the drink. Our customers get creative, too - we've had people have to sing for their cold brews, dance for their mochas, and do all other sorts of crazy things...and the list keeps growing! Can't come in to the store? Now, you can Pay It Forward online! Buy any drink online, and we'll put it up on the board for anyone to redeem! Please note that all online Pay It Forwards will take up to 48 hours to be placed on the Pay It Forward Board.